I recently learned from a friend of mine that in India there is a holiday that celebrates and worships tools and household goods. Of course I had to look into this further as I feel I celebrate objects everyday, especially historic designs. Dussehra (Maha Navami) is a hindu festival that celebrates the victory of good over evil (that’s the short version). It is also known as Vijaya Dashami and in some locations it spans for up to 10 days. It begins on the 10th day of the bright-half of the month of Ashvin, according to the Hindu calendar. This year, Dussehra began October 3rd. Besides the prayer meetings, special offerings to the gods, outdoor fairs and parades, certain areas of India have local celebrations. In the state of Karnataka, Dussehra is celebrated with the blessing and worship of house hold goods and work-related tools such as computers, books and kitchen utensils. There is an effort to see the divine spirit in the objects and tools that help us succeed in our daily lives. It is not uncommon to see vehicles such as mopeds, buses and trucks decorated with flowers and offerings. In the spirit of celebrating objects that help us live better lives, there are three companies that I’d like to celebrate simply because I use them everyday. I think of them, not only because of their utility and quality, but also for the beauty in their design and essence. 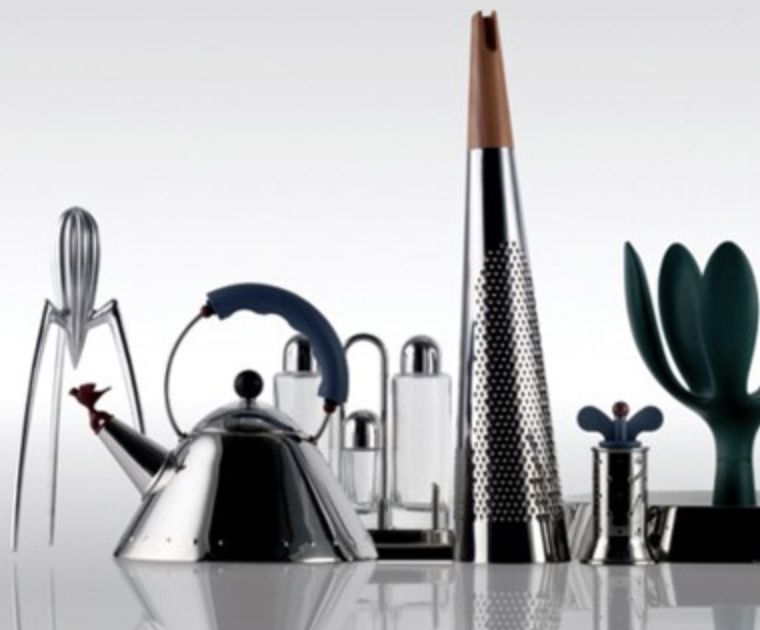 The history of Alessi begins in 1921 with a passion for quality and finely crafted work. In 1970 Alessi evolves into a company that believes design is a language capable of capturing the audience’s imagination, and the relationship between objects and people goes beyond functionality. The nickel- chrome or silver plated house hold and tableware goods have become internationally re-known design collectibles. Kettles, citrus-squeezers, kitchen timers and bottle openers are all tools that have have been designed with an array of design theories and minds behind them. Among them, the idea that “Form is the result of an inner life that needs an object” - Richard Sapper. The Dansk company was founded in 1956 by Ted Nierenberg, an American entrepreneur and engineer, who while visiting Copenhagen feel in love with a hand-forged flatware set made of stainless steel with teak handles; the design work of Jens Quistgaard. Quistgaard would design for the company from it’s inception until the mid 1980’s and was the creator of the Kobenstyle line of cookware. The beautiful enameled steel pots and pans were the solution to a lighter and less expensive cast iron cookware. Kobenstyle’s signature colors were red, blue and yellow, later introducing black and white. These and new colors were brought back into production in 2012 after being discontinued for 20 years. The lid on Dansk Kobenstyle cookware is easy to grasp and also serves as a trivet. The teak wood handles of the pans connotes Quistgaard’s mastery of combining different materials while adding warmth to the cookware, designed not only for cooking but also for serving. A younger company creating lasting products is Mud Australia. Founded in 1994, every porcelain piece is handmade in Sydney, Australia. It is a small company with only several stores and stockists in 10 countries, however they focus on global ideas of serving and collecting. Clean lines and a timeless color palette allow these serving pieces to be mixed and matched and blend in with any living space. Each piece is oven, microwave and dishwasher safe. Mud Australia has a large variety of sizes for their vessels, plates and platters, as well a several designs to choose from for bowls, allowing buyers to easily select pieces that fit in to their lifestyle. Functional yet personal. Newer:More Design Events Happening NowOlder:On The Wall, Wallpaper or Paint?